Capitol Corridor’s transfer program allows you to connect to local bus and light rail systems in most of the communities we serve. It’s free! See Transit Transfers. 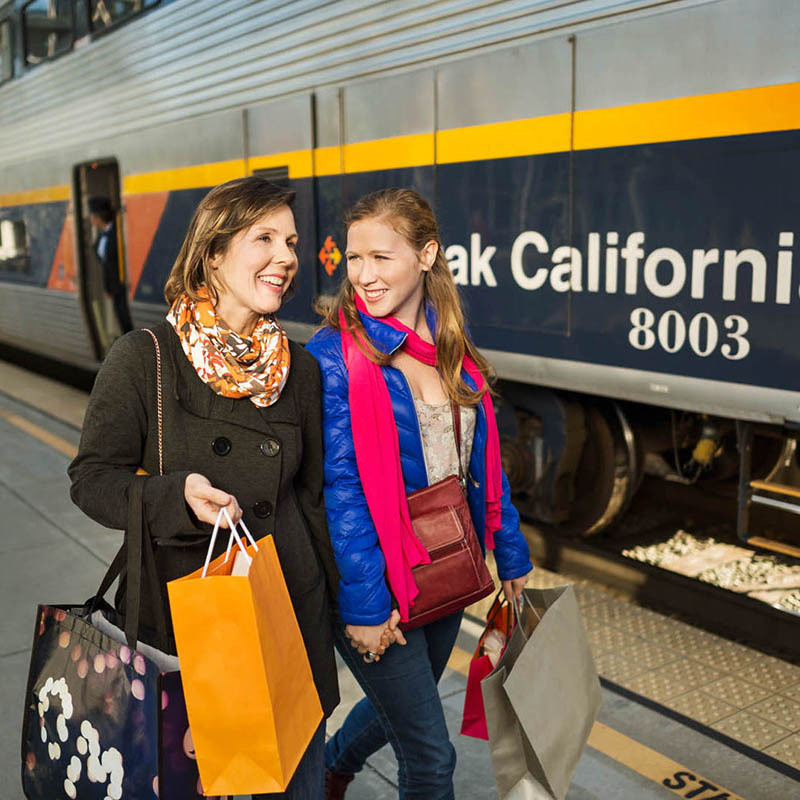 Together with Amtrak, Capitol Corridor operates several dedicated connecting bus routes that connect you from the train to areas throughout California and even to Nevada and Oregon. Visit our bus connections page. Connect to BART, the San Francisco Bay Area’s transit system, at Richmond and Oakland Coliseum. Passengers cannot add value to Clipper cards on board Capitol Corridor trains; however, there are many convenient ways to load value including online and by setting up Clipper’s Autoload feature. The Capitol Corridor/Amtrak station at Oakland Jack London Square is a short walk to the San Francisco Bay Ferry terminal. From here you can board a ferry for a relaxing and scenic ride to San Francisco (AT&T Park for Giants games, Pier 41, and the Ferry Building), South San Francisco, Alameda, Oakland, and Vallejo. Learn more. Capitol Corridor connects to the Oakland International Airport, San Francisco International Airport, Sacramento International Airport and San Jose International Airport via local transit. See Airport Connections. To offer our Placer County passengers more flexibility, Capitol Corridor has established reciprocal ticketing programs with two local transit agencies. That means your ticket to ride just got better! See Joint Ticketing. There are some convenient options to get to your final destination. Checkout Zipcar.com or GIG Car Share which just launched an all-electric fleet of vehicles in Sacramento. For a limited time, enter the promo code CCRAIL once you download the GIG Car Share app to receive two hours free. Seamless Journey From The Rails To The Road. Hertz car rental services are available at San Jose, San Francisco, Oakland, Sacramento and Emeryville stations. Visit hertz.com. Tideline is a water shuttle with commuter service between the Berkeley Marina and downtown San Francisco at Pier 1.5 by the Ferry Building. The Berkeley Marina is one mile from the Berkeley Station, ideal for connecting via bike or a short bus ride on AC Transit’s Line 81, which has a stop just two minutes away on 4th St. From here, you’ll zip across the Bay in 20-30 minutes, with free Wi-Fi, beverage service, and flat screen TVs. Learn more. For the San Francisco Bay Area, visit 511.org. For Sacramento visit sacregion511.org.